We believe that the most important aspect of the German Shepherd breed is temperament. We pride ourselves on not only owning and showing German Shepherds, but also breeding dogs with excellent temperament that will ensure that they can happily be part of any family. We are not only breeders of dogs that represent excellence and quality, we are also owners of pets. Kassaar is our registered breeder's prefix. We first started breeding german shepherd dogs in 1992. 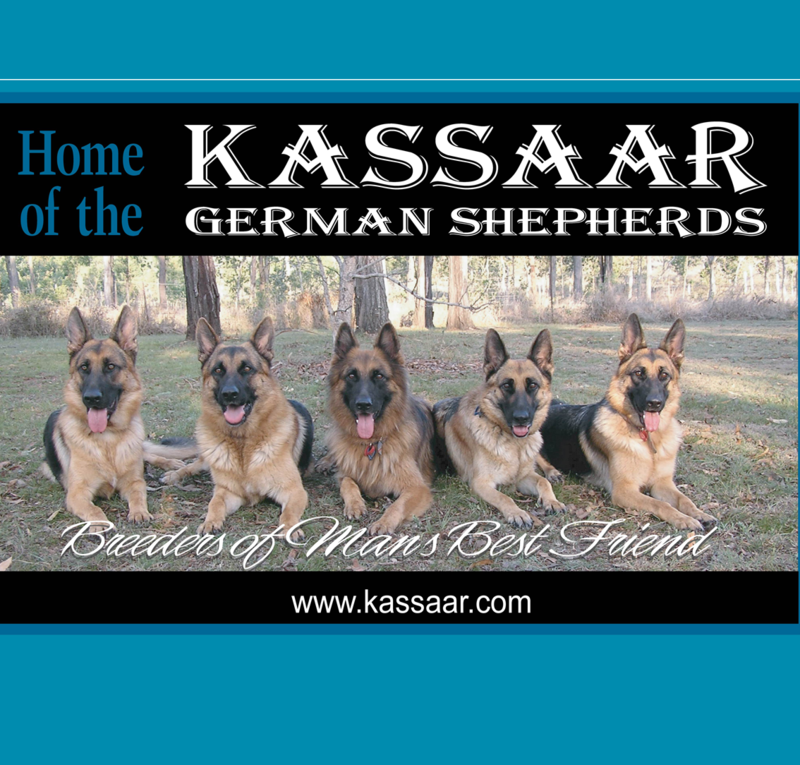 To us, our name represents the most important aspect of the German Shepherd breed and that is temperament. We aim to guarantee that our dogs abide to all breeding standards and strive to improve the breed itself, and understand that excellent temperament and soundness always comes first. Our kennel is growing, having recently acquired some excellent bloodlines. We will continue to add new bloodlines, as we aim to contribute to the betterment of German Shepherds in Australia. We comply with all the guidelines of the Australian National Kennel Council, the GSD Club of Queensland and the Canine Control Council. All our dogs are x-rayed for both hips and elbows and breed surveyed. We also ensure that we only use stud dogs of high caliber, good bloodlines and excellent temperament. Our results in the show ring are also starting to speak for themselves. We pride ourselves on breeding dogs of high standard, sound temperament and lovely natures, that are not only a pleasure to own, but dogs that will become an integral part of your family, who you will not only fall in love with but wonder how you lived without! We do not use dogs that have not conformed with various schemes that are in place with the governing bodies whether here or overseas including the hip/elbow scheme. Some of our dogs have received their certificates/passes overseas prior to us importing them; others that we have bred or bought are checked in Australia. We will not use dogs that have nasty or aggressive temperaments as this generally passes onto their offspring, nor will we use any animal with a known genetic fault. Our dogs are our family members first and for-most, show dogs second. Our dogs are not treated like kennel dogs and spend their days running free and playing and they are brought up together. People are stunned when they come to our house seeing so many German Shepherds, young and old, male and female running and playing together. - Puppy Pack loaded with goodies and in depth informational guides, and training tools to help with the transition of your new family member. All our babies are sold with full registered pedigree paperwork. We sell all our puppies on a Main Register (not limited). You will be supplied with full copies of all the parents paperwork including copies of their pedigree papers, hip/elbow certificates, breed surveys etc. We also provide help and support for you and your new family member, not only from the time of purchase but for the rest of your baby's life. If you have any questions please contact us or visit our website for more information.